Every professional photographer knows the importance of becoming a strong photographer and distinguishing their business – and themselves – from the competition. And one of the best ways to do that is to challenge and show off your level of professional and personal excellence! 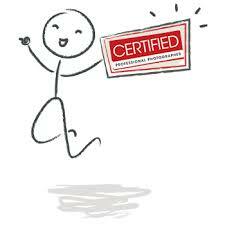 That's where becoming a Certified Professional Photographer (CPP) comes in. The Certified Professional Photographer credential was started in 1977 as a way to identify professional photographers who have demonstrated technical competence through a written exam and photographic evaluation. Advertising: Competition is very often fierce among professional photographers, and differentiating yourself from the masses is crucial. Becoming a CPP instantly distinguishes you as someone who is serious about the business of photography. Pricing: One significant challenge often faced by professional photographers is justifying prices. Clients don’t always understand how or why your prices are set the way they are. However, being a CPP allows you to easily explain the value in choosing your services. Confidence: When prospective clients learn about the effort that goes into becoming a CPP and that you have to recertify every three years, they’ll quickly understand how seriously you take continued education and training when compared to the competition. If you're a CPP, maybe you'd like to consider helping other professional photographers earn the same distinction! As a CPP Liaison, you'll help others just like you who want to better themselves and our industry. Just like working to become a CPP, being a CPP Liaison takes some dedication. Up for the challenge? We're glad to hear it. Learn more about becoming a CPP Liaison! Consider being a part of the CPP Facebook Group or the CPP Community on theLoop! It's the place for photographers who have earned their CPP to mingle with other goal-oriented photographers. But as with any social media, the CPP Facebook Group is for connecting and socializing, so for any question regarding official CPP information, send us an e-mail at PPA cppmailbox@ppa.com. Every three years CPP’s must Recertify by submitting Continuing Education Units (CEUs) or retaking the exam. Recertification signifies that you are continuously learning and evolving in your craft. By maintaining your CPP designation, you distinguish yourself as an accomplished professional photographer committed to the continuous improvement of your skills and knowledge. Read more about the process and submitting your Recertification!